A University of Virginia Medical Clinic sees one or two patients a week for injuries from…of all things…yoga. That’s an unfortunate side effect of the practice’s boom…20.4 million Americans do yoga and on average spend $500 a year on clothes and retreats. Reporter Lydia Wilson spoke with a teacher-turned-entrepreneur trying to reverse the rising trend of yoga injuries. In a downtown Charlottesville gym, I am surrounded by the standard yoga gear: a mat, two foam blocks, a strap, and a blanket, but for the first time in the ten years that I’ve taken yoga , a teacher hands me a coaster-sized accessory I’ve never seen before -- called a Flip-Chip. That’s Nina Jackson. In her other job as a physical therapist, she saw patients injured by well-meaning yoga teachers. One might see a new student’s hips are too far forward and then reach to pull the hips back, not knowing the person had a previous injury there, for example. So, Jackson invented the Flip- Chip to improve student and teacher communication. Student Adriana Vito has been taking Nina’s yoga class for a year and a half – and was nervous to start because she didn’t want to aggravate a previous back injury. Not just yoga students get injured. Swami Vidyananda has been practicing yoga since 1969 and now manages a 200 hour teacher training at Yogaville, -- one of the oldest training centers in the United States, located 40 miles south of Charlottesville. She says that today’s yoga postures were developed 5,000 years ago when yogis were sitting still. 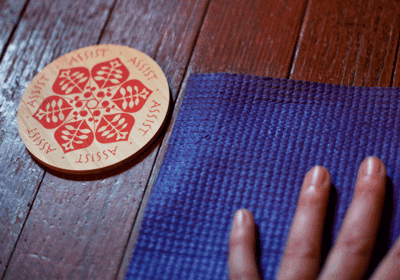 Flip -Chips are in use by yoga teachers in 28 US states and even on a military base in Japan.